Guitarist Lorne Lofsky is unquestionably one of Canada’s hidden treasures. He records infrequently, tours rarely and prefers to stay close to his home in Toronto, teaching students at York and Toronto Universities. 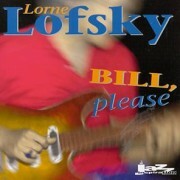 Enticed by the news that a new recording is in the works, it’s as good a time as any to revisit his fine 1994 recording, Bill, Please.Lofsky has made a name for himself on occasional recordings and tours with Oscar Peterson, but when left to his own devices, his mainstream approach to jazz guitar is harmonically more informed by Lennie Tristano. Traces of Lenny Breau and another talent-deserving-wider-recognition, Ed Bickert, with whom Lofsky played from 1983 to 1991, are also evident. But the artist who informs this session the most is, not surprisingly, Bill Evans. Not only does Lofsky cover four Evans tunes, but he also tackles double and triple overdubbed solo pieces, à la Evans’ Conversations with Myself. Lofsky manages to create layers that sometimes swing, as in Evans’ “Song for Helen”, and are sometimes more textural, as in his ethereal reading of Wayne Shorter’s “Fall”. On the eight trio tunes, bassist Mike Downes and drummer Jerry Fuller are the perfect foils for Lofsky’s explorations. Whether keeping a lightly swinging pulse on John Lewis’ standard, “Django” or propelling Lofsky forward on Wayne Shorter’s “E.S.P.”, Downes and Fuller follow Lofsky’s lead while, at times, driving him in unexpected directions. While the set is comprised mostly of mainstream titles, there is something both contemporary and timeless about the way Lofsky and the trio approach this often-covered material. There is plenty of interplay and clear chemistry between the players, which allows them to take the material places lesser musicians could not. What makes this set sound as vibrant today as when it was recorded nearly ten years ago is the constant appearance of the unexpected in Lofsky’s playing. Bill, Please is one of the finest recordings of guitar-based jazz to come out of Canada. One can only hope that Lofsky’s new recording will be as full of challenge and surprise.